The 2018 hurricane season started a few weeks early for the Emerald Coast with Subtopical Storm Alberto making landfall in May. This system had maximum sustained winds of 65 mph and minimum pressure of 990mbar. Rainfall totals reached 8.69 inches in some areas and the storm surge was measured at 3 feet. The typical hurricane season begins June 1 through November 30. The NOAA is predicting 10-16 named storms throughout this 2018 season. 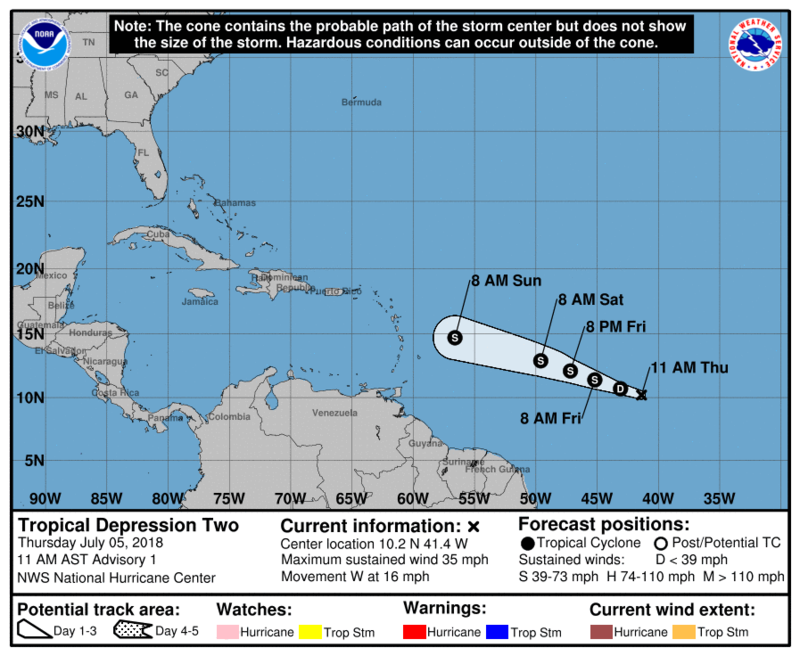 As of June 5th, the NOAA is currently watching Tropical Depression Two, which is moving west at 16 mph; current sustained winds are at 35 mph. During the next 72-96 hours, the NOAA expects the system to increase in speed and continue to travel west towards Puerto Rico and the Dominican Republic. There are a few key tips to keeping you and your family safe during this storm season. Have a Plan: It is important to have a plan whether you’re staying at home during a storm or evacuating to higher ground. Plan for the worst; map out your evacuation route to avoid any confusion during a stressful time. Emergency Supplies: Have at least a 3-day supply of food and water. Food should be easy to prepare and not expire (canned soup, pastas, powdered milk, etc.) Also have a 3-day supply of any medications you may need during the storm. Other items include toothbrushes, soaps, baby wipes, contacts/glasses, etc. If you’re using items from the previous year, be sure to check expiration dates. Prepare for Power Outages: Flashlights, weather radios, phone chargers and extra batteries will be very helpful during a storm. Window Protection: Protecting your home from as much damage as possible during a hurricane is extremely important. If you do not have hurricane shutters that can be locked with a key or are permanently installed, plywood is another great alternative. Be sure to measure your windows prior to purchasing materials; to allow for easy installation, number your windows and plywood pieces. If you have damage to your home after a storm, do not hesitate to call your insurance agent. Todd Claim Service will work with you to ensure you get the most out of your insurance claim. We have serviced the Emerald Coast for over 56 years and are the most trusted insurance adjusters in the area.